This close run match enabled two scratch sides to iron out some of the creases and both teams will have taken benefits from the experience. 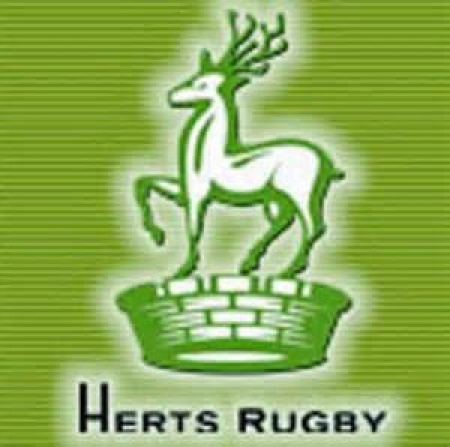 Hertfordshire will be pleased with the win, however fraught, and Surrey, enjoying their first outing at this level will be far from downhearted with a spirited performance. Tom Banks, the lively Bishop's Stortford scrum half tore over early on after good work by Chris May and Josh Sharp converted neatly. Ollie Turner, full back and one of the Surrey stalwarts, closed the gap with a penalty a few minutes later. At the end of the first quarter visiting tight head Cameron Zeiss received a ten minute rest for an infringement in the red zone. George Elliott took immediate advantage of the resulting overlap to dot down close enough to the sticks for Sharp's second improvement. The next Herts ploy looked to be going well until the ball went loose and was hacked on fully seventy metres into the path of five Surrey attackers. Somehow Turner knocked on with the line at his mercy. He made partial amends with a penalty. Surrey lynchpin Ian Kench then touched down for a pushover try and Turner brought the score at the brake 14-13. The second period saw the Surrey set scrum, creaking up till now, improve enough to allow a try claimed by the entire pack. Turner again obliged but Banks, a constant thorn, scampered over almost immediately. Sharp obliging once more. Turner gave his side back the lead with a penalty as the match turned scrappy and an ill-considered clearance by Herts after good scrum work, was gathered and spun wide for Karyim Irving in the left corner. Three magical touches by Anthony Maka and Sharp's conversion drew Herts level once more and the fly half's penalty ended the scoring with five minutes to go. Cornwall will present a different set of challenges next Saturday at Bishop's Stortford kick off 3.00pm.